Information has been brought together from numerous sources for this project. The original census manuscript for the 1880 census is kept at the National Archives, who make the complete record available through microform copies. The Minnesota Population Center partnered with the Church of Jesus Christ of Latter Day Saints to clean and enhance the complete census manuscript as transcribed by church members in the 1980s and 1990s as a genealogical resource. This partnership, among others, led to the creation of the North Atlantic Population Project which makes complete digital records of late-Nineteenth Century censuses of many North Atlantic nations freely available for social science research. Below is a listing of information collected by enumerators, noting variables not transcribed by the LDS volunteers. The files disseminated by the Minnesota Population Center include the transcribed variables, recoded according to contemporary standards, and with additional information about each household. These data have been aggregated to create summary files for Enumeration Districts. Schedule 1. Free Inhabitants in ______, in the County of _____, State of ______, enumerated by me, on the __ day of ____, 1880. Enumeration district No. ____. 1. Dwelling houses numbered in order of visitation. 2. Families numbered in order of visitation. 3. The name of every person whose place of abode on the 1st day of June, 1880, was in this family. 4. Color – White, W; black, B; Mulatto, Mu; Chinese, C; Indian, I. 6. Age at last birthday prior to June 1, 1880. If under 1 year, give months in fractions, thus, 3/12. 7. If born within the census year, give the month. 8. Relationship of each person to the head of this family – whether wife, son, daughter, servant, boarder, or other (not coded by LDS). 9-12. Single, married, widowed/divorced, married during census year. 13. Profession, occupation, or trade of each employed male or female. 14. Number of months this person has been unemployed during the census year (not coded by LDS). 24. Place of birth of this person, naming State or Territory, or the country of birth. To maximize their use for systematic analysis, the historical maps need to have accurate geographic coordinates. To achieve this we relied on contemporary GIS maps of the cities, using the U.S. Census Bureau’s Topologically Integrated Geographic Encoding and Referencing system (TIGER 2000-2005) and the Environmental Systems Research Institute adapted version of those same files (ESRI 2003). These files were edited by hand to correspond with the street layout of cities in 1880. To do this involved deleting streets or highways constructed after 1880, adding those that were demolished, changing names of others, and in some cases correcting the alignment of streets. TIGER shape files are the basis for county boundaries, and these were edited to correspond with 1880 boundaries by the National Historical GIS Project. The Urban Transition Project eventually aims to geocode individual households, recording their positions along the street grid in the same sort of file that is used in modern GPS systems to find address locations. Grant support from the National Institutes of Health and the National Science Foundation was used to contract with the Minnesota Population Center to transcribe street addresses for residents of the 39 large U.S. cities. Address ranges for city blocks have changed from 1880, in many cases quite radically, but contemporary address ranges offer a first approximation of locations. Pittsburgh presents unique challenges even for contemporary address systems. These have been overcome with the assistance of the Pittsburgh Street Addressing Project and Matt Mercurio, GIS Manager for Allegheny County. There are many on-line sources that facilitated editing the contemporary GIS maps to fit the historical city street grids. Because EDs typically are subdivisions of city wards, one key source is ward maps. The Library of Congress compiled a volume identifying Ward Maps of United State: A Selective Checklist of Pre-1900 Maps in the Library of Congress. We accessed this volume through the Cornell University Library (MAPS +Z 6028 .U575 W2). Cornell’s Map Collection has microfiche copies of the 232 maps described in this list (OLIN MICROFICHE 1546). The David Ramsey Map Collection has an invaluable set of high quality digital historical map images of U.S. cities. The Sanborn Fire Insurance maps offer more detail than most other sources, and proved particularly useful when additional information was needed to locate residential alleys or other features of densely developed downtown districts for some cities. City directories published during the period are another major source of information about city streets and addresses. They often include detailed street maps. In some cases they provide a list of the street boundaries of wards and/or electoral precincts. 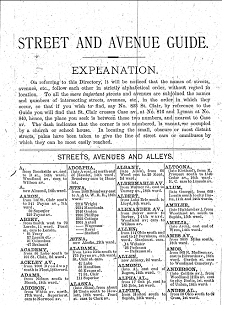 Directories usually contain a comprehensive description of the location, direction and length of streets, sometimes including the address ranges between intersections (as in the “Street and Avenue guide” from the 1880 Cleveland Directory illustrated here). A guide to the volumes for each city used in this project is City Directories of the United States, pre-1860 through 1901: a Guide to the Microfilm Collection (Woodbridge, CT: Research Publications, 1984). Many local sources, including libraries and local history associations, were used to trace street name changes over time in several cities(for example, Buffalo, Chicago, Cleveland, New Orleans, New York City), neighborhood maps, building names and other historical information.